A statue of Odin rests on my altar. 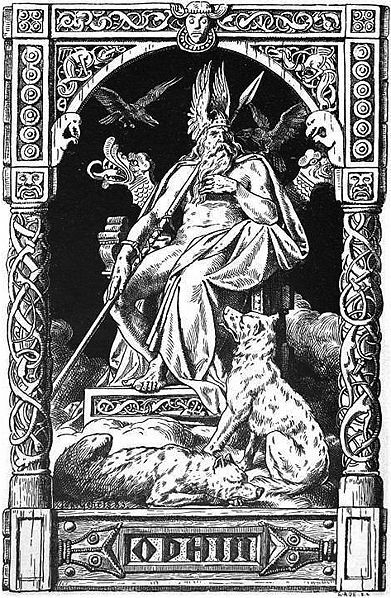 It portrays Odin seated upon his throne, with two ravens perched on his shoulders, telling him of the worlds’ news; at each side of him sit two wolves. He holds a spear or staff in his right hand and a drinking horn in his left hand. The drinking horn is decorated with runes. A symbol of three interlocking triangles is on his chest. The back of the statue depicts Odin hanging from the World Tree as a sacrifice. The runic inscription from the Havamal reads: “Take I up runes, I took up runes.” He is a symbol of strength, endurance and wonder to me. Before I bought the statue of Odin, I did not have a God figure on my altar for years. While I do not practice the Northern Traditions, I want to learn more about my Scandinavian roots and family. I believe that Odin brings a balance of the God and Goddess energy to my altar. Odin is a powerful figure in Northern mythology. He is recognizable in Heathenism and other Northern Traditions by his appearance and formidable presence. The multifaceted Odin is the god of poetry, wisdom and magic. The Anglo-Saxons knew him as Woden, from which we get the word Wednesday (Woden’s Day). Odin is the Father to all of the Gods and lives in Asgard. He is the Lord of War, Death and Knowledge. He rules in Valhalla, where the fallen Viking warriors recover and the Valkyries dwell. From his throne he can see the whole the world. All his life, Odin has sought knowledge from far and wide. He is fierce in his wisdom and strength and possesses an unquenchable thirst for knowledge. He sacrificed an eye to drink from the Well of Mimir. He suspended himself from the huge ash tree of Yggdrasil, enduring nine days of terrible fasting and agony that he might learn the language and meaning of the runes. Odin has two ravens, Hugin (“Thought”) and Munin (“Memory”). The two ravens fly over the world and return to bring Odin news. One of Odin’s heiti (or nicknames) is Rafnugid (raven god). He often rides the eight-legged horse called Sleipnir (“Slippery One”), bears the valiant dead on his back from the battlefield to Valhalla. Odin’s spear is named Gungnir, because it never misses its target. He owns a golden ring, Draupnir, which forms new rings every morning. The book by David Day inspired me to write this essay about Odin and Gandalf. I admire both Odin and Gandalf. The book is about the research that Tolkien did to create his epic saga. I wanted to know where Tolkien’s research came from and what made him write his books. Reading Tolkien’s Ring allowed me to put all the pieces together. In Day’s book, Tolkien’s Ring, the author draws comparisons and similarities between Odin and Gandalf. Odin wears a wide-brimmed hat low over his head (to disguise his one eye), and he carries a spear. He wears a long grey cloak and understands the language of birds and beasts. His horse, Sleipnir, rides fast and travels between the mortal world and the supernatural world. Sometimes, he assumes the form of an eagle. Gandalf, in comparison, is a wise wizard who wears a wide-brimmed hat, a grey scarf and cloak, and carries a staff. He understands the language of birds and beasts, and gigantic eagles rescue him when he is in danger. He travels over Middle Earth — often on the back of the magical horse Shadowfax — aiding the elves, dwarfs, and mortal men in their struggles to reclaim and defend their homelands against Sauron and Saruman. In Tolkien’s Ring, Day argues “The greatest power was in the ring on the hand of Odin, the Magician-King of the Gods. Odin was the AllFather, Lord of Victories, Wisdom, Poetry, Love and Sorcery. He was Master of the Nine Worlds of the Norse universe, and through the magical power of his ring was, quite literally, ‘the Lord of the Rings’.” Day continues, “He carried only a staff (or spear) and was the model for the wandering Wizard and Magicians from Merlin to Gandalf.” The similarity between Odin and Gandalf is clear. The similarity between the two, wizard-god and wizard-more-than-man, is best summed up by short piece from Poems from the Lord of the Rings. This poem captures these two beloved wizards well. Krasskova, Galina. Exploring the Northern Tradition. Franklin Lakes, NJ. New Page Books. 2005. Day, David. Tolkien’s Ring. United Kingdom, Anova Books Company, 2011. Tolkien, J.R.R. Poems from Lord of the Rings. London, Harper Collins Publishing, 2002. Anglo-Saxons (Old English) referred to Him as Wōden rather than Odin, similar to the early High German Wōtan. Tolkien’s academic work at Oxford University as Professor of Anglo-Saxon, was in philology, the study of the Old English language, its origins, and the culture and its influences. This included the study of the Germanic and proto-Germanic (Gothic) origins of both the English and Norse, including myths, legends and fairy tales. The brothers Grimm had a similar interest. You may also be interested in a book by Tom Shippey: “The Road to Middle-Earth, How J. R. R. Tolkien Created a New Mythology”, which talks about his language and culture studies in some depth.